Author and adventurer Jeff Belanger explores the folklore of New England’s southeastern coast. Airdates set for Wednesday, October 29th at 8:00 PM on WSBE, and Thursday, October 30th at 10:00 PM on WGBY. PROVIDENCE, RI. 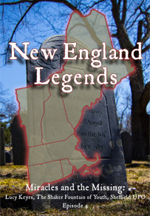 – October 21, 2014 – New England is full of ghosts, monsters, and other mysteries that are more than just campfire tales. These legends and lore are as much a part of New England history as are the famous ancestors whose names grace our towns and schools today. On Wednesday, October 29, at 8:00 PM, Rhode Island PBS will be broadcasting the New England Legends series along with the latest episode “Maritime Mysteries.” This will be the first broadcast of the new episode as part of the fall pledge-drive for the station. New England Legends host Jeff Belanger will be live in the studio for the event. 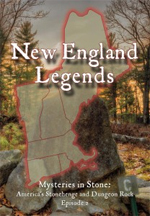 In 2014, “The Spooky Berkshires,” the premiere episode of New England Legends was nominated for an Emmy under the “Magazine Program/Special” category. This year the series returns and takes to the water. “Maritime Mysteries” dives into the ocean waters of southeastern New England to explore the lonely and haunted Rose Island Lighthouse off the coast of Newport, Rhode Island. Then viewers head to shore to ponder an ancient and mysterious stone tower with possible connections to the Knights Templar. Finally, the crew trek up to New Bedford, Massachusetts, to investigate the haunts of abandoned Fort Taber / Fort Rodman. 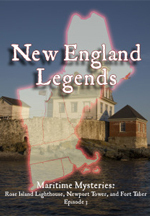 New England Legends is a joint venture between Jeff Belanger and Tony Dunne. The two have been working together since 2009 when Dunne wrote and produced the documentary Things That Go Bump in the Night: Tales of Haunted New England for PBS. Belanger was featured prominently in that first documentary, which went on to national acclaim. 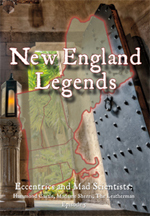 Belanger and Dunne are currently working on future episodes of New England Legends and are actively seeking sponsorship to turn the program into a regular feature across more New England PBS affiliates. About Jeff Belanger Jeff Belanger (www.jeffbelanger.com) is a New England native, author, adventurer, and one of the most visible and prolific paranormal researchers today. Since 1997, the journalist has interviewed thousands of eyewitnesses to paranormal occurrences. He’s the author of more than a dozen books on the paranormal (published in six languages) including the best sellers: The World’s Most Haunted Places, Weird Massachusetts, Our Haunted Lives, and Who’s Haunting the White House? (for children). He’s the founder of Ghostvillage.com, the Web’s most popular paranormal destination according to Google.com, and a noted speaker and media personality. He’s also the host of the cable/Web talk show, 30 Odd Minutes which is available in over 9 million homes in the United States. Belanger has written for newspapers like The Boston Globe and is the series writer and researcher for Ghost Adventures on the Travel Channel. He’s been a guest on hundreds of radio and television programs including: The History Channel, The Travel Channel, Biography Channel, PBS, NECN, Living TV (UK), The Maury Show, The CBS News Early Show, FOX, NBC, ABC, and CBS affiliates, National Public Radio, The BBC, Australian Radio Network, and Coast to Coast AM. About Tony Dunne Award-winning television producer Tony Dunne has called New England home his entire life. After studying film and television production at Emerson College and the University of Massachusetts, Dunne has spent the past 15 years working as a producer in news, commercial, independent, and most recently public television at PBS honing his storytelling skills. He has produced magazine programs, nightly newscasts, quiz shows, lifestyle and health programming, as well as the nationally-distributed documentary Things That Go Bump in the Night: Tales of Haunted New England for PBS. 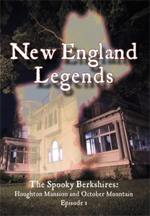 New England Legends: The Spooky Berkshires was produced in 2013 and is the brainchild of paranormal author and legend hunter Jeff Belanger, and PBS producer and director Tony Dunne. Belanger and Dunne first met in 2009 when Dunne was producing his critically-acclaimed documentary Things That Go Bump in the Night: Tales of Haunted New England for PBS affiliate WGBY. Through working together on that project, the two discovered they share a passion for these types of stories… and they learned they were both born at the same hospital in Southbridge, Massachusetts, about a year apart. Not one to question destiny, the two began collaborating. The Boston/New England Emmy Awards recognize outstanding achievements in broadcasting by conferring annual awards of merit in the chapter’s designated award region. This is Dunne’s fourth Emmy nomination and Belanger’s first. Winners will be announced at the 37th Emmy Awards on Saturday, June 7th in Boston. About Jeff Belanger Jeff Belanger is a New England native, author, and adventurer. He’s the author of more than a dozen books on the paranormal (published in six languages) including the best sellers: The World’s Most Haunted Places, Weird Massachusetts, Our Haunted Lives, and Who’s Haunting the White House? (for children). He’s a noted speaker and media personality on the subject of the unexplained. He’s also the host of the cable/Web talk show, 30 Odd Minutes, which is available in over 9 million homes in the United States and Europe. Belanger has written for newspapers like The Boston Globe and is the series writer and researcher for Ghost Adventures on the Travel Channel. He’s been a guest on hundreds of radio and television programs including: The History Channel, The Travel Channel, Biography Channel, PBS, NECN, Living TV (UK), The Maury Show, The CBS News Early Show, CBS News Sunday Morning, FOX, NBC, ABC, and CBS affiliates, National Public Radio, The BBC, Australian Radio Network, and Coast to Coast AM. About Tony Dunne Award-winning television producer Tony Dunne grew up in central Massachusetts, but has called Western Massachusetts home for well over a decade now. After studying film and television production at Emerson College and the University of Massachusetts, Tony has spent the past 15 years working as a producer in news, commercial, independent, and most recently public television at PBS honing his storytelling skills. Tony has produced magazine programs, nightly newscasts, quiz shows, lifestyle and health programming, as well as the nationally-distributed documentary Things That Go Bump in the Night: Tales of Haunted New England for PBS. New series follows author and adventurer Jeff Belanger as he explores the folklore of New England. SPRINGFIELD, Mass. 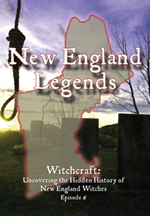 – October 22 , 2013 – If we’re to believe the history books, folklore, and thousands of eyewitnesses over the last few centuries, New England is full of ghosts, monsters, and other mysteries that are more than just campfire tales. On October 31st at 10 PM, PBS affiliate WGBY in Springfield will premiere New England Legends, a new television series that follows adventurer and author Jeff Belanger as he explores these many tales around New England. Two half-hour episodes will air back-to-back on October 31st: “The Spooky Berkshires” and “Mysteries in Stone.” “The Spooky Berkshires” examines the tragic history of the Houghton Mansion in North Adams, Massachusetts, and its century-old haunting, then heads up to October Mountain in the Berkshires to chase down stories of Bigfoot sightings, UFOs, and the ghost of a young girl said to haunt an abandoned cemetery somewhere deep in the woods. “Mysteries in Stone” takes viewers north of Boston to a 4,000-year-old calendar in Salem, New Hampshire dubbed “America’s Stonehenge,” before heading south to Lynn Woods on Boston’s North Shore to explore tales of pirates, buried treasure, and a man who spent his life tunneling through solid rock because spirits told him he’d find gold. Belanger partnered with Tony Dunne, who wrote and produced the documentary Things That Go Bump in the Night: Tales of Haunted New England back for PBS in 2009. Belanger was featured prominently in that first documentary, which went on to national acclaim. The two have been discussing producing a regular television series ever since. Jeff Belanger (www.jeffbelanger.com) is a New England native, author, adventurer, and one of the most visible and prolific paranormal researchers today. Since 1997, the journalist has interviewed thousands of eyewitnesses to paranormal occurrences. He’s the author of more than a dozen books on the paranormal (published in six languages) including the best sellers: The World’s Most Haunted Places, Weird Massachusetts, Our Haunted Lives, and Who’s Haunting the White House? (for children). He’s the founder of Ghostvillage.com, the Web’s most popular paranormal destination according to Google.com, and a noted speaker and media personality. He’s also the host of the cable/Web talk show, 30 Odd Minutes which is available in over 9 million homes in the United States and Europe on Sky TV. Belanger has written for newspapers like The Boston Globe and is the series writer and researcher for Ghost Adventures on the Travel Channel. He’s been a guest on hundreds of radio and television programs including: The History Channel, The Travel Channel, Biography Channel, PBS, NECN, Living TV (UK), The Maury Show, The CBS News Early Show, FOX, NBC, ABC, and CBS affiliates, National Public Radio, The BBC, Australian Radio Network, and Coast to Coast AM. Award-winning television producer Tony Dunne grew up in Central Massachusetts, but has called Western Massachusetts home for well over a decade now. After studying film and television production at Emerson College and the University of Massachusetts, Tony has spent the past 15 years working as a producer in news, commercial, independent, and most recently public television at PBS honing his storytelling skills. Tony has produced magazine programs, nightly newscasts, quiz shows, lifestyle and health programming, as well as the nationally-distributed documentary Things That Go Bump in the Night: Tales of Haunted New England for PBS. Saw the show today, very interesting, very well done. I am excited about future episodes and hopefully visiting some of the sites you feature on the show. Best of luck to all involved. Best show ever!!!! As a former teacher, I appreciate all the background and historical research that goes into every episode, makes the legends all the more believable/scary!!!! Have shared all over FB and would love to see as many episodes as possible to produce. Keep up the great work! New England Legends Copyright © 2019.